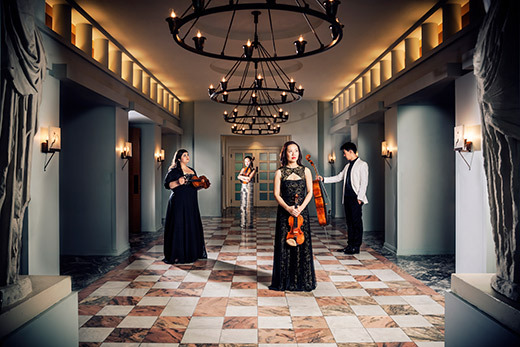 The Vega String Quartet, Emory's acclaimed quartet in residence, will be featured with other musicians in two events this month: Sept. 8 for Mozart @ the Museum and Sept. 16 for the Emory Chamber Music Society of Atlanta's 25th Anniversary Gala Concert. Photo by Nate Dorn. The Emory Department of Film and Media Studies continues its Cinematheque series titled “Resisting Fascism” each Wednesday at 7:30 p.m. in White Hall, room 208. This month’s film screenings include “The Mortal Storm” (1940), “Casablanca” (1942), “To Be or Not to Be” (1942) and “Hangmen also Die” (1943). The Michael C. Carlos Museum presents AntiquiTEA Sept. 7 at 4 p.m., as well as Cocktails & Camelids Workshop for Adults on Tuesday, Sept. 12, at 7:30 p.m., a program in which participants will learn how to spin fiber, dye threads and weave small pouches. A gallery talk on Wednesday, Sept. 13, at 7:30 p.m. features a tour of the Greek galleries exploring the Greek origins of Wonder Woman, while a coffee tasting and gallery talk on Saturday, Sept. 16, at 10 a.m. will include a tasting of several coffees from the Americas followed by a tour of "Threads of Time: Tradition and Change in Indigenous American Textiles." This month’s Carlos Reads event on Monday, Sept. 25, at 7:30 p.m. features a reading in Spanish of “Hombres de Maíz (Men of Maize),” by Nobel Prize-winning Guatemalan author Miguel Angel Asturias. A Creativity Conversation between Carolyn Lucas, associate director of the Trisha Brown Dance Company, and dancer Jamie Scott begins a year of collaboration between Emory Dance and the Trisha Brown Dance Company. The two will discuss the life and work of the late legendary post-modern dance artist Trisha Brown. This free event takes place Thursday, Sept. 7, at 7 p.m. in the Dance Studio in the Schwartz Center for Performing Arts. Fiddler Alicia Svigals, pianist Marilyn Lerner and clarinetist Laura DeLuca will perform Svigals’ award-winning live score to the 1918 Pola Negri silent film “The Yellow Ticket” Thursday, Sept. 7, at 8 p.m. in Emerson Concert Hall. The Emory Chamber Music Society of Atlanta (ECMSA) kicks off its 25th anniversary season this month. On Friday, Sept. 8, at 12 p.m., pianists Julie Coucheron and William Ransom along with members of the Vega Quartet perform works for piano four hands and Mozart’s G Minor Piano Quartet as part of the free event Mozart @ the Museum. On Saturday, Sept. 16, at 8 p.m., ECMSA welcomes violinist William Preucil, the Vega Quartet, tenor Bradley Howard, pianists William Ransom and Elena Cholakova, and others to celebrate 25 years of chamber music at the 25th Anniversary Gala Concert and Reception. Emory organist Timothy Albrecht presents a one hour recital of keyboard masterpieces by Bach in Timothy Albrecht performs Bach Live! Sunday, Sept. 10, at 4 p.m. in the Emerson Concert Hall. In addition, the Gary Motley Trio performs a free concert to release its new album, “No Reservation Required,” on Sunday, Sept. 17, at 4 p.m., while renowned flutist Jonathan Keeble joins the Emory University Symphony Orchestra in a performance of Emory Director of Performance Studies Richard Prior’s “Concerto for Flute and Orchestra” Saturday, Sept. 30, at 8 p.m.
Kirk Savage, professor and chair of the University of Pittsburgh's Department of Art and Architecture, delivers the lecture “Iconoclasm and the Confederacy: The Challenge of White Supremacy in the Memorial Landscape,” Sunday, Sept. 17, at 4 p.m. at the Michael C. Carlos Museum. Following the lecture, Andra Gillespie, associate professor in Emory's Department of Political Science, gives a short response and joins Civil War memorialization scholar Daniel Pollock and Savage in discussion. The event is part of the David Goldwasser Series in Religion and the Arts. An evening of music, art and conversation to celebrate the public unveiling of artist Ross Rossin’s large-scale portrait of Frankenstein as described in Mary Shelley’s 1818 novel happens Tuesday, Sept. 19, at 7 p.m. in the Emerson Concert Hall. The event is free and open to the public. Thirteen playwrights, six actors and a bedroom come together for Theater Emory’s “Midnight Pillow,” premiering Thursday, Sept. 21, at 7:30 p.m. in the Theater Lab of the Schwartz Center for Performing Arts. Performances continue through Oct. 1; tickets are now on sale through the Arts at Emory Box Office. Capping off the month, “The Dream Machine: The Beat Generation & the Counterculture, 1940–1975” exhibition opens in the Schatten Gallery of Emory's Robert W. Woodruff Library on Thursday, Sept. 28, with a free public event at 6:30 p.m. Earlier that afternoon at 5 p.m., Beat poet, editor, performer, activist, artist and educator Anne Waldman participates in a Creativity Conversation with poet Kevin Young, an Emory University Distinguished Professor who is now director of the Schomburg Center for Research in Black Culture in Harlem.